Having reached the “end” of Netflix (a la “watching everything interesting that is currently available to stream”), an app was recently brought to my attention that has unlocked countless more movies and shows: hola! It was a (very) easily downloadable extension for my Chrome browser, and within minutes we were experiencing an entire new world of movies and shows that are available in other countries. Read a bit more about it on the Business Insider site by clicking this link… or run and download it right now, no real instructions necessary. That being said, we recently watched Disney’s John Carter, and found it a good source of entertainment for the over-two-hour mark. It is an interesting mix of the movies Gladiator, Stargate, Avatar, I daresay Mission to Mars (though neither of us have seen it, just ‘Mars’ being in the name of it), and one more that we can’t quite put a finger on. Recently (and finally), I watched the award-winning documentary March of the Penguins. Since I was young and in grade school, I have had this great appreciation for these mini tux’d up waddlers.. It may have started in 3rd grade when we read this book Mr. Popper’s Penguins and afterwards had a short assignment to write a letter to Mr. Popper(for one reason or another). To our surprise, we received responses! Mine included kind words and most exciting, a promise of a pet penguin! Oh, I was super excited as you can imagine –a penguin! Of course, had I not been a believer as I was at that impressionable age, I would have realized that the letters of response were most likely written by students in a higher grade than ours, also as an assignment. Well, I waited eagerly, for a penguin that would never come. As I “grew up” however, I realized the reality behind it all (after all, a pet penguin, in FL?… lol), but my fascination for these creatures did not dwindle. The demand for beef has become so high that in order to fill this ever-increasingly tall order, the manufacturing plants (the places where the cows go to get “chopped up” for lack of a better way to express it) find it increasingly difficult to keep diseased meat from spreading; the workers come in contact with so much meat that if one bit is diseased, it easily gets spread. Their solution? We’ll just run it through an ammonia-cycle and ta-da! “Clean meat.” No joke, this stuff undergoes somewhat of a wash cycle (looks like a laundry machine, kid you not), and then gets pressed into patties such as the one above.. boxed, shipped.. feeling chunks rising). (With the disclaimer that I’m not 100% sure on what they feed their cattle, these interesting couple of aerial pics) As the demand for beef increases and suppliers attempt to fill the orders, more and more cattle are now being fed strictly grain diets – which as we all know is not what their main diet is supposed to consist of (for healthy cattle, anyways)! 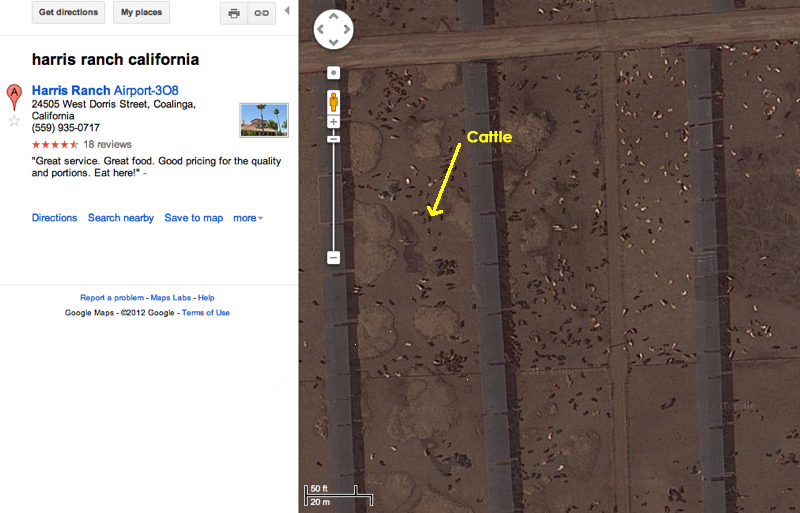 On visiting this particular ranch in California, I noticed that their cattle were “grazing” in all-brown surroundings. 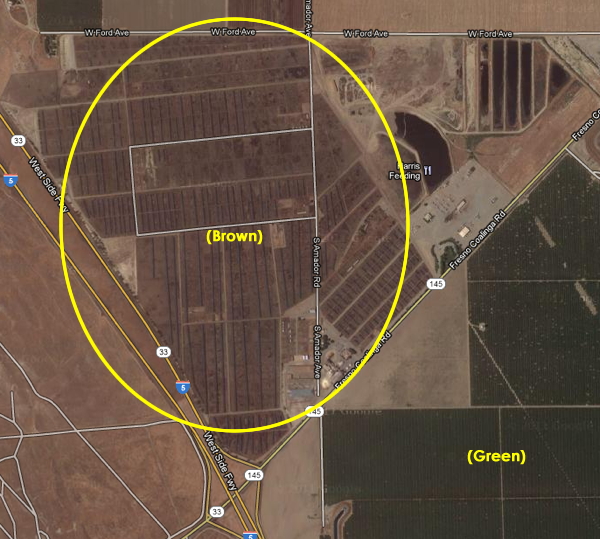 A Google map image shows something interesting: the same brown “fields.” Where is the grass in all this?………. Again, maybe this particular farm does feed their cattle greens however, their fields look quite a bit different than the green pastures I was used to seeing cattle grazing in in Germany. It’s just a bit more realistic to me now that I’ve seen this documentary & aerial image. I liked their steaks. Worth investigating. Anyways, there were some other disturbing images, but this to me was the most. To eat something that has been treated with ammonia, to actually crave it (b/c let’s face it, I would crave a Big Mac or cheeseburger once in a while) makes me now want to upchuck that treated chuck! Gross. This is not including any other form of meat, this is simply beef. The documentary covers much more! Makes me then also think of all the other things I shouldn’t eat.. that’ll be another day tho.. my burger cravings have since come to a screeching halt – and believe me if I had a child, I would do as my mother did and never allow me to eat there (Thank you to both of my parents for always, Nutella aside! giving us healthy foods to grow up on). Thank you, Food, Inc., for explaining to me (and showing me) exactly what “processed” means. Highly recommend this documentary, if you are interested in quality food and how you can help yourself be just a tad healthier. Enjoyed this show : ) (maybe because my high school career didn’t include the drugs or promiscuity parts… or any of the other “really” crazy parts lol it’s more of a vicarious re-living of how many teens spent their time in the modern day, without all the negative side-effects!). They will not be bringing it back for another season (boOoo), but you can take a look by clicking the images.